Remember the Uncanny Valley? It's that place where robots look very much like the biological entities that they're meant to emulate, but just dissimilar enough to give them a very creepy appearance. 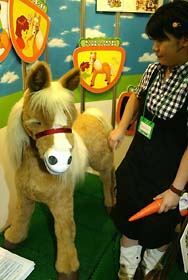 Well we'd suggest that Sega Toys' upcoming Dream Pony falls squarely into the valley, as the 4-foot tall bot certainly resembles a real mini horse -- though as you can see in the pictures (both here and after the jump), it probably has the potential to really freak people out. Nonetheless, Sega is confident that this latest addition to its zoo of robotic pets will be popular enough among little girls (and immature men such as ourselves) that it can move 10,000 of these strange toys per year. Since you wouldn't pay $600 for a stuffed animal that just sat around looking weird, Dream Pony -- a virtual doppelgänger for Hasbro's Butterscotch -- responds to visual, audio, and tactile stimulation by jerking its head around or emitting a frightened whinny, among several other forms of exciting feedback. Although this robopony won't actually trot around the neighborhood like the real one your parents would buy you if they weren't so stingy, you can still sit on its back (assuming you're under 80 pounds) and "feed" it a plastic carrot over and over again. All-in-all, the Dream Pony doesn't really seem to provide the kind of long-term playability you'd get from an Xbox or a Robosapien, but once your little girl starts begging and whining for one, you'll have little choice but to welcome Dreamy into your home.